Sheffield Hallam University sent out tenders for this refurbishment works to Level 6 Lift Area and Circulation Area, NRC was awarded this contract and looked upon this as a “time to shine”. Works consisted of the removal of a metal screen and doors replacing with a solid Ash screen and double doors, all with high specification fittings. Removal of 3 sets of double doors and replacing with Ash finished doors, replacement of sets of full Ash doors and purpose made Ash louvers. Removal of the old tiled flooring in the lift lobby area, screeding then honing the screed to give an ultra smooth finish ready to receive top of the range floor tiles. Out in the circulation area a purpose made round Walnut veneered cladded panel was added to the old square column. Lighting was upgraded using our own in-house electrical design teams recommendations for energy efficient, regulation requirement and value for money fittings. Uplift and preparation works of the carpet tiles, once again replacing with high specification carpet tiles with complete decoration throughout all the working areas. NRC also designed, supplied and installed the unique decal silhouette for the high level boarders. 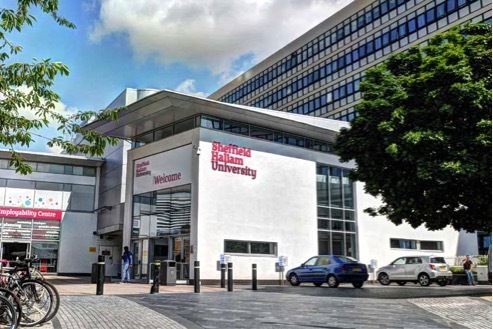 From start to finish we worked very closely with Hallam Universities Project Manager Amanda Hughes, with great results on budget, and primarily with this project – on time.